What Is A Dandruff ? Dandruff is a condition in which the scalp’s excess skin cells die and flake off in small white or gray powder.It is a natural body process of renewing cells and shed old skin on the surface of the skin.This condition is similar to dry skin, and occurs when the epidermal layer in the scalp is replaced excessively.You might have seen that some people are more prone to it than others. The reasons are simple, in that cases a person suffering from dandruff visible has a much faster rate of renewal of the skin or skin cells so that more deaths are emerging. 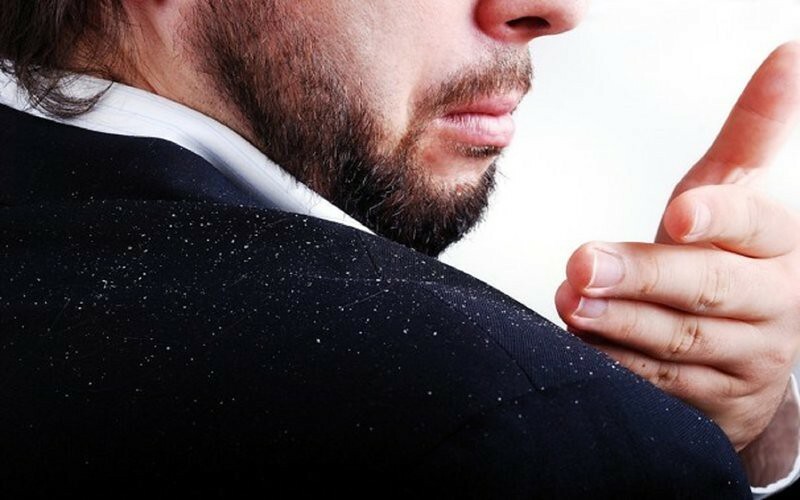 Extreme weather conditions can also be responsible such as heat of the sun will cause dandruff. Dandruff is a fungal infection of the scalp that often does not respond to drug treatment.It is also belief that, dandruff not only caused by dry skin on the scalp,but also may be caused by a yeast or fungal infection on the scalp that causes skin cells to overproduce and die more quickly. As the cells regenerate skin, peeling the dead start. According to Ayurveda problem of Dandruff appears due to an imbalance of the three doshas in which mainly Pitta and Vata involved. In Ayurveda, dandruff is an aliment which is put in the category of “Shodra Rog”. In Ayurveda, pitta is symbolized as heat or fire and vata is dry and rough in nature. In a wrathful state, both doshas produce some unequivocal impurities called Ama that are dried and hot in nature. These infections rise in the deep tissues of the scalp, and damage them. The damage of deep tissues and intensified Vata-Pitta doshas generates the itchy patches of the scalp. Due to these circumstances scalp sheds in a greater amount than the normal amounts of dead epidermal cells, that leads to the problem of dandruff. The Ayurvedic therapy is to pacify Pitta and Vata in general using herbal medicines and a modified diet and lifestyle plan. In addition, specific herbs are applied to cleanse the body of impurities gathered in the digestive system. Use natural aloe vera extract or you may also use a commercially available gel instead.Application is very simple all you need to do is to take aloe very leaf and cut a piece in half. Squeeze the gel from the leaf and apply the gel throughout the scalp. Massage the gel on the scalp using a lot of gel so that it can cover the entire scalp with gel.Keep the gel for about 45 minutes to an hour,then wash the scalp with cold water.You can apply this gel 2-3 times in a week.Do not use any type of shampoo to clean your hair after using the aloe vera.In remaining days you can try washing with a mild shampoo. Lemon juice can also be used against dandruff problem and has proven very effective.You can also use aloe vera gel with the half of lemon juice. Apply this mixture on the scalp, keep it for 30-45 minutes after which you can wash with a hair with plain water. Yoghurt, has also proven beneficial in the prevention of dandruff, as it kills fungal infection. Apply yoghurt on the scalp and let it stand for one hour and wash your hair with a very mild shampoo. Fenugreek has been used to the hair for several generations worldwide. Fenugreek when mixed with aloe vera, increases its power, making it an excellent remedy to stop infections of the scalp dandruff along with hair growth.It’s recipe is very simple all you need is to soak the fenugreek seeds in water overnight and then grind the seeds into a fine paste in the morning. Thereafter, mix aloe vera gel with the fenugreek paste, apply the past throughout the scalp.Let it for half an hour so that this remedy absorb excess sebum and kill the fungus.For the best results it may take some days but if this treatment followed twice a week for a month you will see a marked improvement in the condition of your scalp. Eucalyptus oil is another common herbal known for its medicinal properties, is effective against dandruff. To make a paste you can use eucalyptus oil with pure aloe Vera extract or gel. Apply this paste and massage the scalp remember that this mixture may sting a little because of the properties of eucalyptus oil in it. Leave the gel paste for about 25-35 minutes and then wash with normal water. The medicinal properties of the two herbs will make your hair to clean in the process, so shampoo is not needed for post treatment. Tea tree oil itself is excellent remedy for dandruff. The medicinal properties of tea tree oil extend to be a wonder herb with its incredible potential to kill fungi, bacterial viruses which are even in a very large degree.The application recipe is very simple mix a few drops of this oil with aloe vera gel. Remember that you do not use tea tree oil directly on the skin, as it is very powerful it may cause a strong burning sensation. Use this remedy 3 times a week and without washing with a shampoo and you will find dandruff is reduced or disappears in a few days.